1Department of Hematology, Sultan Qaboos University Hospital, Muscat, Sultanate of Oman. 2Deartment of Renal Medicine, Hull and East Yorkshire Hospitals, Kingston upon Hull, United Kingdom. 3Department of Clinical Microbiology and Parasitology, College of Medicine, King Khalid University, P. O. Box 641 Abha, KSA. Department of Hematology, College of Medicine and Health Sciences, Sultan Qaboos University, Muscat, Sultanate of Oman. Al-Khabori M, Bhandari S, Al-Huneini M, Al-Farsi K, Panjwani V, Daar S. Side effects of Deferasirox Iron Chelation in Patients with Beta Thalassemia Major or Intermedia. Oman Med J 2013 Mar; 28(2):121-124. Objectives: Chelating agents remain the mainstay in reducing the iron burden and extending patient survival in homozygous beta-thalassemia but adverse and toxic effects may increase with the institution and long term use of this essential therapy. This study aimed to estimate the incidence of deferasirox (DFX) side effects in patients with thalassemia major or intermedia. Methods: A retrospective study of 72 patients (mean age: 20.3±0.9 yrs; 36 male, 36 female) with thalassemia major or intermedia treated at Sultan Qaboos University Hospital, Oman, was performed to assess the incidence of side effects related to deferasirox over a mean of 16.7 month follow-up period. Results: Six patients experienced rashes and 6 had gastro-intestinal upset. DFX was discontinued in 18 patients for the following reasons: persistent progressive rise(s) in serum creatinine (7 patients; 40% mean serum creatinine rise from baseline), feeling unwell (2), severe diarrhea (1), pregnancy (1), death unrelated to chelator (2) and rise in serum transaminases (2). Three patients were reverted to desferoxamine and deferiprone combination therapy as DFX was no longer biochemically effective after 18 months of therapy. There was no correlation between baseline serum ferritin and serum creatinine or a rise in serum creatinine. Cardiac MRI T2* did not change with DFX therapy. However, there was an improvement in liver MRI T2* (p=0.013). Conclusion: Renal side effects related to deferasirox appear to be higher than those reported in published clinical trials. Further larger studies are required to confirm these findings. Keywords: Chelator; Kidney function; Thalassemia; Toxicity. This observational study is aimed at estimating the incidence of deferasirox (DFX) related side effects during the first two years of therapy in patients with thalassemia major and intermedia at a single centre in Oman. This retrospective study consisted of 72 consecutive patients with thalassemia major or intermedia who received deferasirox (DFX, Exjade, Novartis) iron chelation therapy at the day care unit of Sultan Qaboos University Hospital (SQUH), Muscat, over a period of two years commencing May 2009. A prospectively collected database of thalassemia patients treated at SQUH was used and patients’ records were used when information was not available in the database. Data was collected on patient demographics, therapy and outcome variables of the thalassemia population of all age groups. Variables collected included patient demographics, serial measurements of serum ferritin, creatinine, alanine transaminase (ALT), aspartate transaminase (AST), iron load in liver and heart as estimated from Magnetic Resonance Imaging (MRI) T2* technique, and the complete blood counts. The estimated glomerular filtration rate (eGFR) was calculated using the Modification of Diet in Renal Disease (MDRD) four variable equation.6 This was used for clinical decisions in a subset of patients where this formula was validated but was not part of the analysis. The side effects or reasons leading to cessation of chelator therapy (deferasirox) or necessitating a change in initial therapy were studied. Ethical approval for the study was granted by the Sultan Qaboos University Medical Ethics Committee. Chelating therapy is aimed at removing excess iron from the body. DFX was introduced as part of routinely available chelators in 2009. The departmental policy of using chelating therapy was defined as detailed. Patients with thalassemia major were started on DFX if they developed adverse events or were non-compliant to the other chelators. Patients with thalassemia intermedia were started on DFX if they refused deferoxamine (DFO) or they were on hydroxyurea. The starting dose was 20 mg/kg/day if the serum ferritin was >1000 µg/L and a lower dose if the serum ferritin was <1000 µg/L. This was increased to 30 mg/kg/day provided no toxicity was evident with less than 30 mg/kg/day. Larger doses (up to 40 mg/kg/day) were utilized if needed. Before DFX was commenced, all patients had assessment of liver transaminases, serum creatinine, eGFR, urinary protein, creatinine ratio and hepatitis/human immunodeficiency virus screen. DFX, as recommendations indicate, was not commenced in patients with an ALT>300 IU/L, serum creatinine above the upper limit of normal (ULN), significant proteinuria or a history of nephritic syndrome. The dose of DFX in this study was reduced if the serum creatinine increased to >33% of the baseline value on two consecutive tests not less than 2 weeks apart. If the serum creatinine increased >60% of the baseline value (although still within the normal range) or increased to >ULN, DFX was discontinued for 1 week, the renal function was then repeated and DFX was restarted at a lower dose with close monitoring of the serum creatinine. Continuous variables are expressed as means with standard error of the mean (SEM) or as medians if not normally distributed. Categorical variables are expressed as frequencies. Comparison between groups was done using paired t-test for continuous variables and McNemar test for categorical variables. All tests were two sided and alpha level of 0.05 was used for statistical significance. MiniTab stats pack software (Minitab 16 Statistical Software , State College, PA: Minitab, Inc.) was used for the statistical analysis. We analyzed 72 patients (36 males, 36 females) with a mean age of 20.3±0.9 years (range: 6-37). The mean baseline serum creatinine and ferritin were 39±1 µmol/L and 3059±309 µg/L respectively. Ten patients were Polymerase Chain Reaction test positive for hepatitis C virus (all had normal renal function at baseline). Of these 72 patients, 66 were available for complete analysis, while 6 had incomplete data in relation to MRI T2* reassessment. No patient had known pre-existing renal disease or hypertension but 6 had non-insulin dependent and 2 insulin dependent diabetes mellitus. At the time of commencement of DFX, 65 patients were on a combination of DFP (deferiprone) and DFO for control of iron overload; 2 on DFO, 3 on DFP and 2 on no treatment (thalassemia intermedia). Thirty five patients were not compliant with DFO and 4 had experienced agranulocytosis with DFP therapy necessitating discontinuation. 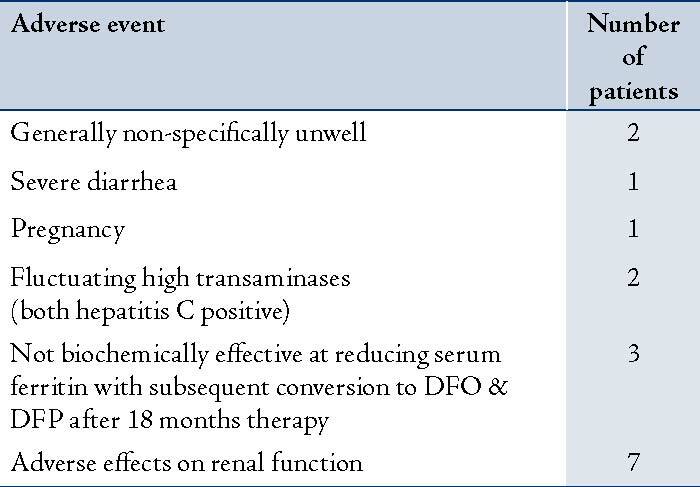 A further patient required DFP discontinuation due to commencement of therapy for hepatitis C.
In terms of adverse events; during a mean follow-up period of 16.7±0.7 months, there were 2 deaths unrelated to chelators (hepatocellular carcinoma in a patient with hepatitis C and cardiovascular related death in the other). Six patients experienced rashes and 6 had gastrointestinal upset (nausea, vomiting or diarrhea). DFX was discontinued in 18 patients (25%) for reasons detailed in Table 1. A greater than 33% increase in serum creatinine from the baseline was seen in 46 patients with DFX therapy. There was a significant rise in serum creatinine in the cohort from the baseline (39±1 µmol/L), rising to a peak of 61±6 and stabilizing at 48±2 µmol/L (p<0.001) at the last follow-up (Fig. 1). This equated to a mean rise in serum creatinine of 25±6%. The peak percentage change in serum creatinine was 58.7±6.6% rise as a whole. In 7 patients, therapy was discontinued because of persistently raised serum creatinine levels (11%); of whom, 6 failed re-challenge with reduced dose of DFX due to rising creatinine beyond 33% of the baseline. Serum creatinine in one patient (DFX 30 mg/kg/day) rose over the ULN and the patient was not rechallenged. Moreover, eight patients (12%) had a successful dose reduction of DFX followed by an increase to a therapeutic dose. However, 6 of the 8 patients with diabetes had significant rise in serum creatinine of an average of 40% from the baseline. Examination of the relationship to serum ferritin revealed no correlation between serum creatinine and serum ferritin. A poor correlation was observed between the initial rise in serum creatinine and the baseline level of serum ferritin (r=0.14). Serum ferritin did not change with the use of DFX in the follow-up period of the study (3059±309 vs. 2965±309 µg/L; p=0.9). There was also no correlation in renal function with cardiac T2* or liver T2* observed in patients with available data. Cardiac MRI T2* did not change with DFX therapy (22±1 to 22±1 at last follow-up; p=0.4). However, there was a significant improvement in liver iron load as shown by increased liver MRI T2* measurements (3.8±0.5 to 4.1±2.2; p=0.013). Figure 1: Change in serum creatinine with introduction of deferasirox in a cohort of Thalassemia patients (n=66). Data shows are serum creatinine (µmol/L) at baseline, peak value and at last follow-up in the whole group of Thalassemia patients exposed to chelator therapy. There were significant differences between peak to baseline, and last follow-up to baseline (p<0.001 and p<0.001, respectively). The findings of this retrospective study of a cohort of thalassemia patients in a single tertiary-care centre were that side-effects from the use of chelator therapy are not uncommon and appear to influence the choice of therapy. Serum creatinine was noted to increase in a large number of patients exposed to deferasirox, necessitating either a dose reduction and/or withholding therapy. However, these observations are not entirely consistent with those observed in published clinical trials. The EPIC cardiac study,7 which was a Phase 3, multicentre study of pediatric and adult patients taking deferasirox, initially reported that 38% of patients developed an undefined "mild increase in serum creatinine." In 25% of these patients, the creatinine returned to baseline without any change in therapy; while in the remaining patients, the creatinine was stable. This study progressed to 5 years and suggests the safe use of DFX in relation to renal function in patients with normal baseline renal function and no risk factors such as diabetes, proteinuria or hypertension.8 The difference in the findings of high rates of renal side effects in the current study in comparison to published trials may in part be explained by the differences in the data from clinical trials, which consist of a highly selected group of patients versus a more realistic study examining all candidates with a few exclusions. 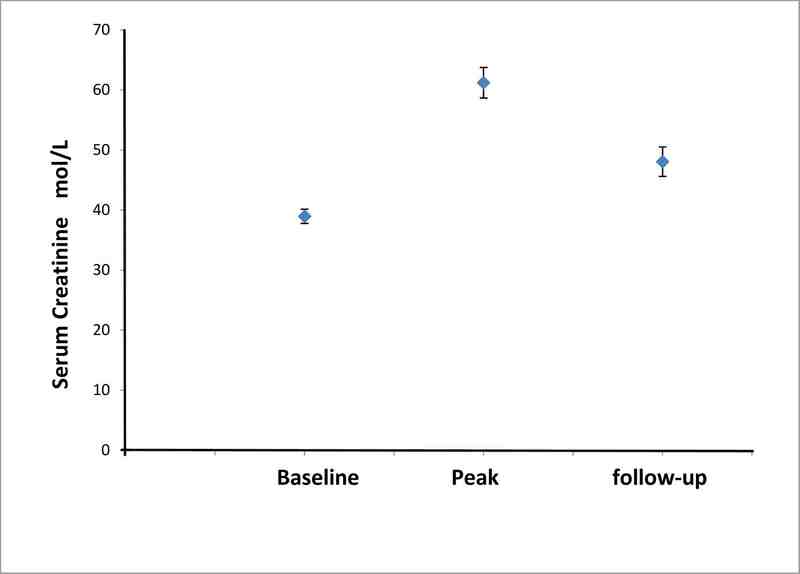 There was no significant reduction in serum ferritin in the study group during follow-up. Although these are heavily iron loaded patients in general, it is well recognised that DFX, and indeed any chelator, may take more than 2 years to demonstrate significant biochemical and clinical effects. In addition, measurement of serum ferritin may not account for rapid movements of iron between cellular compartments. Although this study had several limitations, it presents valuable information for the practicing clinician. The study sample size was small; a single centre was used and the data was observational. Therefore, one can only assume that any causal relationships are speculative. There was no detailed assessment of potential de novo renal disease, which may occur and exacerbate glomerular dysfunction. Hepatitis C, which was present in several patients, may potentially cause mesangiocapillary glomerulonephritis, but no evidence of this was observed. Side effects are not uncommon with DFX; and therefore optimal combination therapy is required to achieve the best clinical outcomes while minimizing the side effects. Monitoring of patients with thalassemia in terms of the heart, endocrine organs (thyroid, testes, ovaries, and pancreas), and the liver is currently routine practice but additional attention should particularly be given to regular monitoring of renal function in patients who are at an increased risk of complications or on chelator therapy. In order to achieve this, flexibility of use of chelating agents is needed to achieve this and to avoid any long-term problems arising as a result of therapy, potentially leading to what has been termed "iron misplacement". The possible strategies would include alternate day use to allow a washout period or to lower the dosage in combination with other chelators to limit the adverse effects, similar to anti-hypertensive therapy. Furthermore, large and more detailed clinical studies are required to verify these findings, particularly in high risk groups such as diabetic patients with thalassemia. Murtadha Al-Khabori, Sunil Bhandari, Mohammed Al-Huneini, Khalil Al-Farsi, Vinodh Panjwani, and Shahina Daar reported no conflict of interest. Sunil Bhandari would like to thank Apopharma for the honorarium and travel support. 1. Olivieri NF. The beta-thalassemias. N Engl J Med 1999 Jul;341(2):99-109. 2. Rund D, Rachmilewitz E. Beta-thalassemia. N Engl J Med 2005 Sep;353(11):1135-1146. 3. Hallan SI, Ritz E, Lydersen S, Romundstad S, Kvenild K, Orth SR. Combining GFR and albuminuria to classify CKD improves prediction of ESRD. J Am Soc Nephrol 2009 May;20(5):1069-1077. 4. Matsushita K, van der Velde M, Astor BC, Woodward M, Levey AS, de Jong PE, et al; Chronic Kidney Disease Prognosis Consortium. Association of estimated glomerular filtration rate and albuminuria with all-cause and cardiovascular mortality in general population cohorts: a collaborative meta-analysis. Lancet 2010 Jun;375(9731):2073-2081. 5. Ninomiya T, Perkovic V, de Galan BE, Zoungas S, Pillai A, Jardine M, et al; ADVANCE Collaborative Group. Albuminuria and kidney function independently predict cardiovascular and renal outcomes in diabetes. J Am Soc Nephrol 2009 Aug;20(8):1813-1821. 6. Kuan Y, Hossain M, Surman J, El Nahas AM, Haylor J. GFR prediction using the MDRD and Cockcroft and Gault equations in patients with end-stage renal disease. Nephrol Dial Transplant 2005 Nov;20(11):2394-2401. 7. Cappellini MD, Cohen A, Piga A, Bejaoui M, Perrotta S, Agaoglu L, et al. A phase 3 study of deferasirox (ICL670), a once-daily oral iron chelator, in patients with beta-thalassemia. Blood 2006 May;107(9):3455-3462. 8. Cappellini MD, Bejaoui M, Agaoglu L, Canatan D, Capra M, Cohen A, et al. Iron chelation with deferasirox in adult and pediatric patients with thalassemia major: efficacy and safety during 5 years’ follow-up. Blood 2011 Jul;118(4):884-893. 9. Mula-Abed WA, Al-Hashmi HS, Al-Muslahi MN. Indicators of Renal Glomerular and Tubular Functions in Patients with Beta-Thalassaemia Major: A cross sectional study at the Royal Hospital, Oman. Sultan Qaboos Univ Med J 2011 Feb;11(1):69-76. 10. Mula-Abed WA, Al Hashmi H, Al Muslahi M, Al Muslahi H, Al Lamki M. Prevalence of endocrinopathies in patients with Beta-thalassaemia major - a cross-sectional study in oman. Oman Med J 2008 Oct;23(4):257-262. 11. Tanji K, Imaizumi T, Matsumiya T, Itaya H, Fujimoto K, Cui X, et al. Desferrioxamine, an iron chelator, upregulates cyclooxygenase-2 expression and prostaglandin production in a human macrophage cell line. Biochim Biophys Acta 2001 Feb;1530(2-3):227-235.